It’ll take you about a year, or more, to recover from bankruptcy and get back on your feet. If you’re like many Americans who filed for bankruptcy when the housing crisis peaked between 2008 and 2010, you’re probably more than ready to take advantage of current low mortgage interest rates. You may be hesitant to contact a lender for fear of being turned down, but don’t worry. You’re not alone. In truth, many homeowners don’t have an in-depth understanding of how bankruptcy impacts their existing mortgage. It also doesn’t help that there’s a lot of misinformation circulating online about refinancing after a bankruptcy discharge, which can be confusing to the average consumer. If you filed for Chapter 7 bankruptcy, the courts wiped out almost all of your unsecured consumer debts, so when you qualify for a mortgage refinancing loan depends on the type of loan you want. The Federal Housing Administration (FHA) requires you to wait at least two years after bankruptcy discharge before applying for an FHA-backed refinance after chapter 7 loan. Private refinance loans are different, though, and may have easier or more stringent qualifying standards. Qualifying to refinance after Chapter 13 bankruptcy requires a waiting period. Since you’re required to pay off your debts according to a payment plan in this type of bankruptcy, FHA says that you need to show sufficient payment history before applying for new loans. Fortunately, the waiting period may be as little as one year, depending on the facts and jurisdiction of the bankruptcy. You also need the bankruptcy court’s permission to apply. Bear in mind that the black marks remain on your credit report and can be seen by lenders even if you went through bankruptcy seven to 10 years ago. For this reason, refinancing your mortgage after such a financial setback requires you to take some extra steps at the outset to make your loan application attractive to lenders. Taking time to improve your credit score is one of the best ways to increase the likelihood that your refinance loan application will be approved. You can achieve this by paying down your revolving credit lines and paying your bills promptly. Setting money aside in a savings account can also increase the likelihood that your refinance loan application will be approved when you refinance your house after bankruptcy. Lenders typically prefer working with homeowners who can provide evidence that they’re saving money for a rainy day. During the bankruptcy process, you can reaffirm, or agree to pay, some of your secured debts such as a car loan or mortgage. Reaffirming means that you’ll keep and pay those debts. If you fail to pay as promised, even after the court discharges the bankruptcy, the lender can foreclose on your home. Falling behind on your mortgage payments after bankruptcy can negatively impact your ability to qualify for a bankruptcy refi loan. So as you rebuild your credit and finances, make paying your mortgage a top priority so that you can refinance as soon as you’re able to do so. Generally speaking, it’s not the best idea to open new credit card accounts after bankruptcy. After all, your goal is to improve your borrowing and spending habits, and taking on a new credit card may cause you to have more debt that you can handle. Some consumer credit observers note, though, that opening one new credit card account, charging a minimum amount on the card, and paying it on time can cause a quick and significant boost in your credit score. Should you decide to use this strategy to raise your credit score, make sure that you chose a credit card that reports to all three credit bureaus, Equifax, Experian, and TransUnion. You’ll have to show your lender that you’re a good credit risk to get your refinance loan application approved. The more evidence you have that you’re a good credit risk, such as a stable income, a solid budget, and regular debt payments, the more likely a lender will be to take your application seriously. 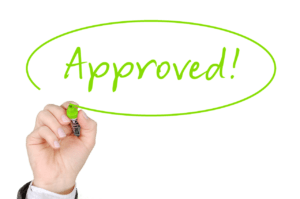 You also may be able to get your lender to push your refinance application through if you can prove that you declared bankruptcy as a result of an unexpected hardship such as a divorce, a death in the family, or a prolonged illness. Should that be the case, writing a hardship letter to your lender explaining the circumstances and showing documentation to verify the circumstance may encourage a lender to work with you. If your residence is in an area where real estate values have been holding steady or increasing, you may have an easier time getting your refinance loan approved after bankruptcy. Most often, lenders want you to have some equity in the home, which you may not have as you emerge from bankruptcy. If you lack equity in your home, making some improvements may increase its value. Should you decide to do some home improvements, consider working with cash you have on hand and avoid borrowing money as this can negatively impact your ability to get your refinance loan approved. Previous post: Should you refinance with no closing costs?